FIFA president Gianni Infantino told President Vladimir Putin on Friday the world was “in love” with World Cup hosts Russia and praised him for overcoming negative stereotypes about the country. 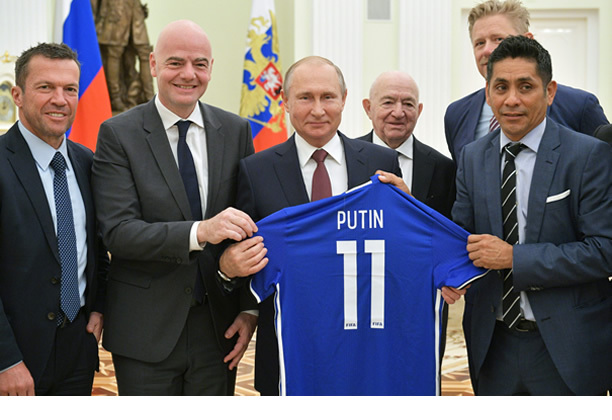 Infantino spoke at a meeting with Putin and former world football stars including former England defender Rio Ferdinand and ex-Denmark goalkeeper Peter Schmeichel. “We all fell in love with Russia,” Infantino told a beaming Putin at the televised meeting in the Kremlin. “Everyone who has been here for a period of time now has discovered a country that we didn’t know.” Despite high tensions with the West, Putin has presided over a well-organised, good-humoured tournament. Human rights groups warn however that he is using the world’s biggest sporting event to gloss over his authoritarian rule. Human Rights Watch said the tournament is taking place “during the worst human rights crisis in Russia since the Soviet era.” But the World Cup has created an unusual carnival atmosphere in traditionally conservative Russia — not least due to the home team’s own unexpected success. “Russia has become a true football country. The virus of football has entered into the bodies of each and every Russian citizen,” Infantino said. Hundreds of thousands of foreigners are visiting, with many saying it has allowed them to discover a different, softer side to Russia. “Many stereotypes about Russia have simply collapsed,” Putin told his guests, who also included Lothar Matthaus of Germany and Marco van Basten of the Netherlands. “People have seen that Russia is a hospitable country which is friendly to visitors.” Infantino praised Putin’s government for busting negative anti-Russian stereotypes. “All the fears that some were trying to put on us with regards to this World Cup, well not only they were not true but it’s actually the opposite.” Infantino was elected president of world football’s governing body in 2016. His predecessor Sepp Blatter resigned following a corruption scandal. Who can handle the Nigerian Nightmare?